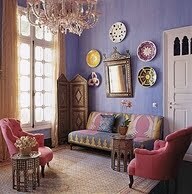 I love the bohemian influence. The colors and mismatched fabrics turn my mood to happy instantly. I love that things don't have to match only compliment. It's a cold day in Northern Cali and the girl in this photo makes me want to take a vacation!